Trenchless Technology Piping offers comprehensive coverage of pipe installation, renewal, and replacement using trenchless technology methods. This step-by-step resource explains how to implement efficient design, construction, and inspection processes and shows how to save time and money with a state-of-the-art project management system. 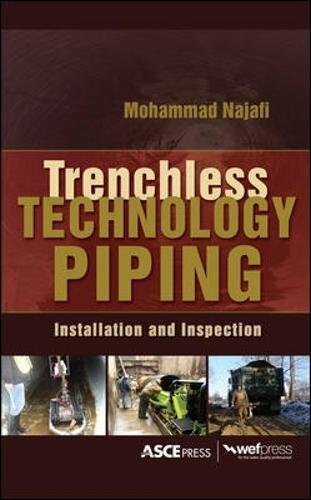 Packed with detailed illustrations, the book surveys the wide variety of trenchless technologies available and discusses the recommended applications for each. This cutting-edge engineering tool also contains vital information on contracting, project delivery, safety, quality control, and quality assurance. If you have any questions about this product by Najafi Mohammad, contact us by completing and submitting the form below. If you are looking for a specif part number, please include it with your message.